I’ve been struggling to fit in any original writing lately what with promoting Runaway Umbrella on line, editing/rewriting a trio of pieces for Otley Writers latest book, singing, crafting,swimming and pilates- which is very, very hard and don’t let anyone tell you it isn’t! I’ve entered the Casket of Fictional Delights 300 wordFlash fiction comp- because their editor Joanna Sterling was one of the earliest magazines to publish my work and give me encouragement; much appreciated. I’ve entered a couple pieces to Gothic.net mag for consideration and Y.A. mag Cicada too. I have to make a decision. A writing decision. Which project do I next commit to- one of the back burner ones? My 1940’s crime novella or my Y.A. novel set in 1910 in Bingley or something else. I still would like to keep writing some flash though to keep my brevity muscles flexed. My own collection of Flash, due out from Chapel Town Books, which I’ve provisionally titled ‘Badlands’ -do you like that title? It was a film in the 1970’s with Martin Sheen by the way. Will be out later in the summer I guestimate. I’m advertising my services as a proof reader (£10 per 1000 words) on Gill James’ blog and sites. I’ve proof read a fair few MS’s lately (mine and friends) and I’m also dipping my creative toes into the pools of tutoring. I am looking into running creative writing workshops in the autumn in Saltaire. More news to follow. Meanwhile editor Stuart Conover at Horror Tree has accepted 2 more drabbles by me for his Trembling with Fear pages to be out imminently. Halloween stories and joining Gill James’ Dream Team…. I am currently writing/editing a trio of pieces to submit to Otley Writers WEA group’s latest proposed publication, an anthology with a Halloween theme, provisionally titled, ‘The Darkening Season’. My pieces of short to longer flash fiction include- ghosts/zombies/a shadow thief who steals children’s soul parts- so all pretty creepy. Good fun though. I have also signed up to join indie press publisher Gill James‘ so called Dream Team- a stable of reviewers/beta readers/editors/proof readers/illustrators etc who would link up under her umbrella to advertise/review and support each others’ work. Gill has kindly given me an author page at http://www.gilljameswriter.eu/p/blog-page.html with the usual beaming photo of me (probably the only good pic of me I like taken in the last 5 years!!!) promoting my skills as a beta reader/reviewer proof reader. I’ve had quite a lot of practise reading writing friends’ MS’s plus my own work so I thought I’d sign up for it officially as it were. She entertained us for 2 hours with her stories/memories/anecdotes/wise words and finally 2 readings from her poetry which she had filed in a glittery shiny folder (just like one I’ve got- really girly) which she’s had since she was 14! It was a great experience listening to her. She talked movingly too of prejudice in the literary world if you don’t fit the narrow mould they are looking for in women writers. In the afternoon in Ben Rhydding I sang with Acabella- a natural voice drop in choir run by the enthusiastic and talented Keely Hodgson, who also runs the poetry/musical events at the Tivoli cafe in Ben R.
The next one is on Thursday June 8th and features poet/musician Genevieve Carver. My first on line in detail author interview is up on this website – with pic and links!!! I try to sound interesting and knowledgeable and funny- not so easy being all 3 at once. I do list my 3 desert island books and advice for new authors though and mention how much eating and drinking I do as a writer. I spend time most days either rewriting/editing/blogging, but I write original creative fiction about 2-3 times a week. I live in a small town, Bingley, near Bradford- probably most famous for the building society which is based there. I write at all times of the day, sometimes into the early hours if I feel I am on a roll; whenever it fits around family and other commitments – like emptying the dishwasher! I drink mugs and mugs of Earl Grey tea while I write, in my study usually with one of our cats sat with me. Well by the radiator really. I write straight onto a old refurbished pc now, using Word and Office surrounded by my favourite pictures and clippings. Though I do still make notes while I’m out and about with a notepad and pen. Each writing tool has its place I find. I have an Audrey Hepburn photo on my windowsill next to a Marilyn Monroe calendar. I love the old movies from Hollywood especially the film noirs starring Bogart and Bacall. In my spare time I sing with a local group, swim, meet up with friends, go to a scrapbooking club, rag rug, ferry my son around, go to the cinema a lot, theatre too and I’m involved with Otley writers- who publish their own anthologies. I write short horror pieces (Flash Fiction), quite a few of which are published in on line magazines, longer spooky stories and fiction for children, so quite a range. 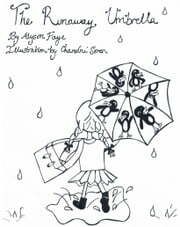 My children’s book ‘The Runaway Umbrella’ illustrated by an art student I know, is now out on Kindle. I am also working on a crime novella set in Post war Britain and a YA novel set in Bingley, but a Bingley of 100 years ago. I’ve been doing a bit of leafletting and dropping flyers off for my children’s e book ‘The Runaway Umbrella’ around town and with a few free book promo websites. It’s up for sale on www.amazon.com too with the active ‘Look Inside’ feature- as well. I’ve also entered a couple of Flash fiction comps and entered a longer short story via the open and free submissions window at https://www.theshortstory.co.uk . They gave me a boost over a year ago when they short listed my flash piece ‘Children’s Games’ in one of their comps. http://onthepremises.com/ run mini contests with free entry too- this time they’re looking for 50 words (half a drabble then) for their latest. That’s a challenge in brevity I rather enjoy though. Next up I am turning my mind to the title and cover picture for my Flash collection which I am working on with Chapel Town Books. I have a table space booked at Morley Literature Festival in October at their indie authors day- where I will (fingers crossed) have a little pile of my collection laid out like hot cross buns and it will be a great opportunity to network.